I got this in the mail. This is what was on the flip side. What was anyone involved in this project thinking? Are they like a blue collar version of Sparkle Motion? 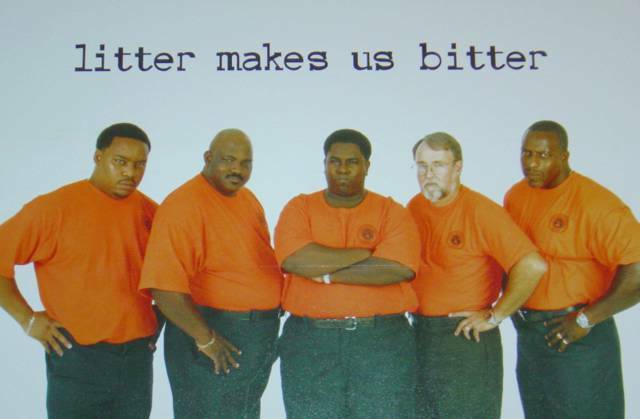 I do like the matching orange shirts, or would you call that tangerine? I wouldn't make them bitter, whatever you do. This may be my favorite community outreach since "Click it, or ticket." Haven't you seen their commercials on TV? They sing like those old time barber shop guys. It's awful, but fun at the same time. Yeah, what were they thinking having the widest guy pose full front to the camera? He should have been in profile.